At the corner of Bowery and Pell, the oldest townhouse in Manhattan was built in 1785 by Edward Mooney, a butcher, following the Revolutionary War. 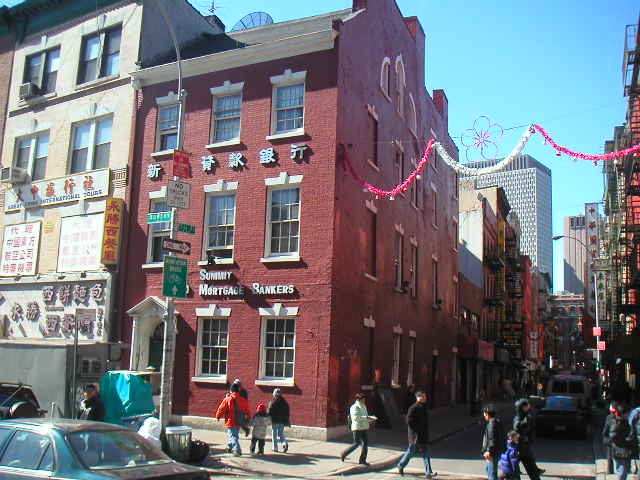 It became a tavern in the 1820's, a store and hotel in the early 20th century, then a pool parlor, a restaurant and a Chinese club, and today is a bank. The architecture combines late Georgian and early Federal styles. Great N.Y. Noodle Town - 28 1/2 Bowery (at Bayard Street) is a great pit stop for an inexpensive but delicious meal. Open late.